So, Ive been playing Monster Hunter Tri on the Wii. Its the only game that has really had me ‘playing it offline’ since WoW. When I end up with a little downtime during work I find myself checking gear combinations, video strategy and crafting charts on the web. Like WoW it has a progressive gearing scheme, where bosses are beaten in order to obtain better weapons to take on bigger bosses. Like WoW it has an online collaborative party mode where four players can team up to beat monsters and complete quests. But thats where it ends. Wheras crafting in WoW is limited to one off perks and the occasional peice of worthwhile gear, crafting in MH is the only real way to improve your stats. There is no XP, no periodic boosts to attributes for simply levelling up, there are no ‘class’ skills and there are no healers. Access to harder quests and elite monsters is restricted via a ranking system that requires you to complete certain key quests before you advance. This does funnel your progression somewhat but is fairly unobstrusive and there is always the option of ‘freehunt’ excursions with no time limits or specific objectives. MH is a quite simple game in terms of scale and size (only 5 or so zones, with a dozen areas in each), but there is great depth in its RPG and combat systems. You improve your character soley through crafting and upgrading weapons and armor to higher quality items. This does impose a traditional gating system, requiring the player to kill the fire monsters in order to craft the fire weapons to help kill the water monsters and so on. There are similar expectations when attempting certain quests to craft appropriate armor (poison resistance for certain bosses, faster swimming for others). However none of the challenges are rigidly linked to the ‘correct’ gear choices, you can play with a fair degree of personal preference. Indeed there are many variations of gear/playstyle that cater for different players styles, there is no ‘best weapon’ (something that demonstrates the well balanced deisgn). Classes are essentially replicated by weapon types. For instance, equipping a longsword transforms your attacks, movement and defence abilities into those that reward rconsistant and repeated flurry attacks mixed with small degree of evasion. Equipping a lance requires you to play a much slower game, with powerful counters and long range attacks interspersed with strategical blocking. Each weapon type has pros and cons, yet all are feasible in battle, especially in a group setup. 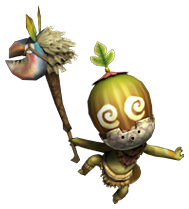 There is also little barrier to players swopping weapon type at any point, or even using different types for different bosses. In a sense there are some traditional MMOG roles, Sword and shield users frequently act as debuffers and Hammer users can stun/KO, but there are no healers and no tanks. There is also little room for error (especially with more difficult monsters), three deaths in one mission will end the quest (no matter who died or how many times), everyone is repsonsible for themselves and unlike WoW (where it is very easy to just tag along with a group or stand at the back of the raid spamming a few keys) you will die pretty quickly if you aren’t paying attention. Learning how to deal with specific enemies and use certain weapons efficiently will improve your performance far more than upgrading your equipment. To this end, monsters exhibit a set of behaviours that are usually prefigured by specific tells or sounds, learning these indications and understanding how best to react is one of the most satisfying aspects of the game. Its very different from most other MMOG instance play where encounters can become simply ‘tank n spank’, even more complex fights are usually reduced to ‘dont stay in the fire’ and dps players can rely on the tanks to keep aggro off them so they can cycle through their standard attacks. When I played through the early stages of the game I was disappointed that the hunting environment appeared to be fairly limited, there is no real exploration or expanisve seamless hunting zones. However I realised that the game isn’t really concerned with exploration but with hunting (the clue is in the title!). The zones are designed as interconnected battle arenas, allowing the enemies to utilise different sorts of terrain and introducing other natural fauna to add randomness and interest to the fights. Developing familiarity with these zones and their inhabitants is also an important skill required in hunting. Even the low level wildlife is well designed, with creatures interacting in interesting ways, there is no predictable pathing of mobs, the creatures in a zone are randomised, and the type of ambient monsters present can seriously change the challenge. Engaging a boss without paying attention to local wildlife (rhenoplos,ludroth,felynes) can spell disaster. There is also an extensive item based creation and usage system buffs,bombs,traps etc extend the combat repertoire of the hunter significantly and add a feedback route to the act of gathering materials within the wilderness zones. Of course like all online collaborative games you can be at the whim of potentially terrible groups, however you can also find yourself 2 manning a difficult mission with ease, simply because the partner you have found is skilled and well prepared. In essence Monster Hunter is a game that rewards repeat play and investment in learning its systems, it isnt an ‘entertainment ride’ like most AAA titles and it does feature some grind. But the grind is more rewarding than in many other games as improving your takedowns of creatures (breaking certain parts, capturing not killing etc) brings with it increased rewards. I doubt that I will stay around for long at high rank, (where the game essentially starts again at increased difficulty) but I am impressed to see that alternative online mmorpg/hybrid ideas this can be implemented this well.